The title of this story is very misleading, because I am the furthest thing from Mom of the Year—though I would like to be nominated for just this school year. With Tim now working in downtown Chicago and leaving our home before 6 am, I spend twelve hours a day being a single parent. I’m up at 6:15 every morning and crash by 11:00 pm, and that is after getting two kids back and forth to two different schools with two different start/end times, working at the youngest’s school, running errands, taking care of our home, cooking dinner, taking said children to their activities/fun/play dates, babysitting other children, and being a wife. By evening, I am an exhausted blob that wonders why no one has invented an IV of coffee straight to my veins. I am 100% fully immersed in being a mom, which by the way is a complete first for me. Up until this school year, I have always had at least one foot in corporate America, working part time for some company, and I spent many years distracted in the world of grief. But all that changed last August as school was about to start. the oldest was entering 7th grade, the youngest was entering 2nd grade—and Eli should be starting kindergarten. And there was the problem for the youngest, Eli was not here to join her at school. Not here to ride the bus with her. Not here for her to show the rules of school. NOT HERE! NOT FAIR! She shouted and cried at me and then shouted and cried some more at the world. There is no grief manual for what to do when your child is throwing a screaming tantrum about her dead baby brother, who died five years ago. I was left feeling helpless as I cradled her as close as I could and just let her cry. Dressed up for Spirit Day - where your favorite movie or book character. My only realistic idea was to leave corporate America and take a part time supervisor job at her school. This aligned with the company I was working for cutting back my hours and downsizing, while at the same time her school had posted an supervisor opening. I applied at the school, not thinking I would hear for days, and was called within two hours for an interview—and hired on the spot. Operation “Help the Youngest” began with a simple “yes” to being at her school for three hours, five days a week. For my youngest, she has blossomed this school year with newfound confidence. She has so much pride and deep rootedness with me working there that it has given her new freedom to flourish. 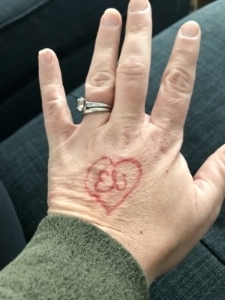 Of course she still misses her baby brother, but there is a sense of great comfort that Momma is close, knows her teacher, and is involved in her daily school life. However, for me, taking this school job feels like the wind carrying me on a new path, a new journey. This new path has me hanging out a lot with others people’s children. Seeing these kids at their best, at their wildest, and their crankiest. If you told me five years ago—hell, even one year ago—that this is what I would willingly choose and that I would actually love it, I would have laughed at you. It’s not that I don’t like kids, I absolutely do. But I have never been involved in the girls’ schooling, never attended a PTO meeting, never volunteered in their classroom more than a few times a year. I have never been that mom. I have always blindly trusted the school system, their teachers, and my girls’ wisdom in choosing friends. Now my eyes have been opened, there is a new fight to be had. And sisters, our children need us. Now more than ever, our children—your neighbors’ children, your nieces, nephews, the kid playing ball down the street—need us. They need adults teaching them about real conversations, conflict resolution, and problem solving. They need us off our phones, off of video games, and paying attention. When I grew up I was the only divorced kid in my class; now it’s my girls that are the exception. They need help finding their way on so much unstable ground. You know the same shaky ground you feel, but with more social media pressure, more technology pressure, and fewer skills to cope with those. Apparently we go outside for recess even in a snow storm. Some days I feel like I’m losing this new battle. Being a kind, loving beacon for them in their unstable world can often leave me depleted. I do get overwhelmed by bad behaviors, disrespect, and words meant to hurt—but the rest of the time, most of the time, these kids are amazing tiny humans who leave me bowled over, laughing. They are healing my heart one minute at a time, and they don’t even know it. Imagine the blow I felt when I was told I would be supervising kindergartners. I spent the first month uneasy, shaky, and trying so hard to block out picturing Eli playing among them. I have my own tantrums as one very sweet five year old has taken to spending every moment of his recess attached to my side. After months of him not leaving me, I see this sweet boy as a gift of healing. More soothing balm came when I received a hand drawn stick figure picture of me with a bunch of kids around me, thanking me for keeping them safe. Soothing balm when they ask if they can come home with me. Soothing balm when a ten-year-old asks why I don’t have a son, and I answer honestly. His response? Well, I will be your son then. Soothing balm as a bunch of fifth grade boys gathered round me on the playground to talk about March Madness. These moments remind me of the bigger picture, the bigger battle that needs me as present as my own girls do. 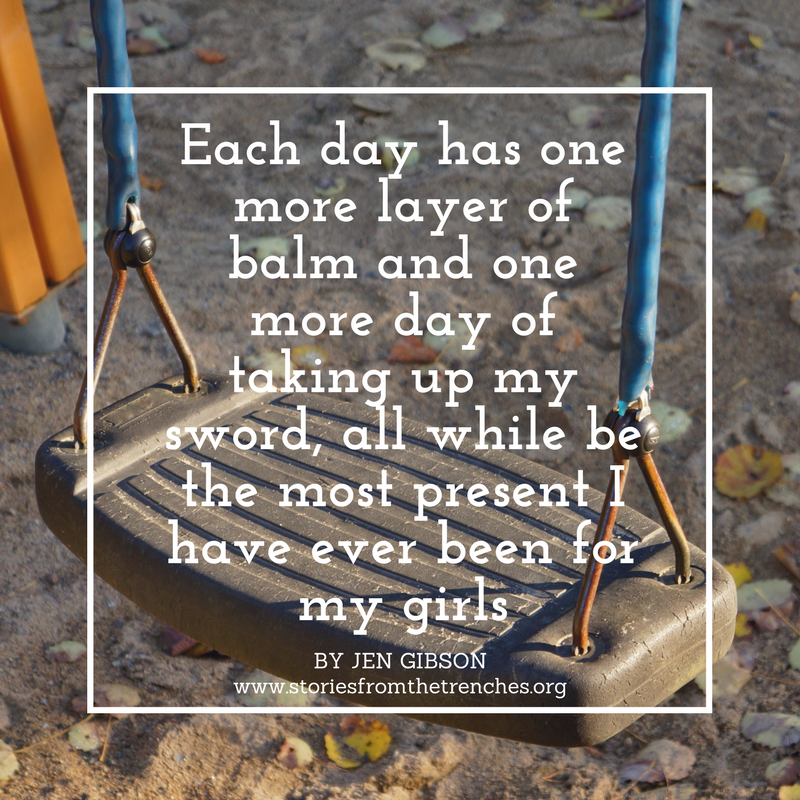 Each day has one more layer of balm and one more day of taking up my sword, all while be the most present I have ever been for my girls. Strange times, my sisters, I feel like I’m living in. A time where being a mom to both my girls and to others is enough. A time where I’m fulfilled, satisfied, and enjoying this new fully-present role. A role that I truly never thought I would embrace fully, especially after sinking into grief. So forgive me, sisters, if my focus is not always on SFTT. It is not because I do not love you, but because I’m soaking up all of these moments with my girls and other people’s children, too.